It’s been a couple of weeks since I went to London to spend a day with Jim Benson about personal kanban. I’ve been trying out different things to help me structure and visualize my work for over two years now. Going from To-Do list hell to the comfortable feeling of a personal kanban was something I already did last year. But you know how it goes, you try one thing and then you get stuck doing that. During that one day workshop, Jim really inspired me to try out new things, actually experiment with other possibilities. Since then I always ask myself: What’s the worst that can happen? And in this case it’s just that I might have spent some time trying something and learning that it doesn’t work for me. 1) my personal kanban needs to be portable, because I’m away from my home-office quite often. So I want to be able to add things to my backlog, WIP or done column when I’m not at home as well. On the left hand side I have my personal kanban matrix (this is a concept loosely based on the Covey Matrix) with 4 quadrants relative to importance and the urgency of tasks. This matrix helps me visualize my backlog in a better way, so that I really see my options more clear. I’ll write up another story on that in a couple of weeks when I’ve really test-driven this way of organizing my backlog. The narrative of my work then moves from Today over Wip to Done (hopefully skipping The pen). I also added a Retro column after done, because sometimes I really have some work that I need to reflect on afterwards. I can’t always make time for this retrospective when I finish the task, so I keep it in this phase until I can make time for it and discover what I can do to improve this type of task. Since I’m a geek, and since it folds to a handy A4 format, I lovingly called it Transformer personal kanban. Neat huh? 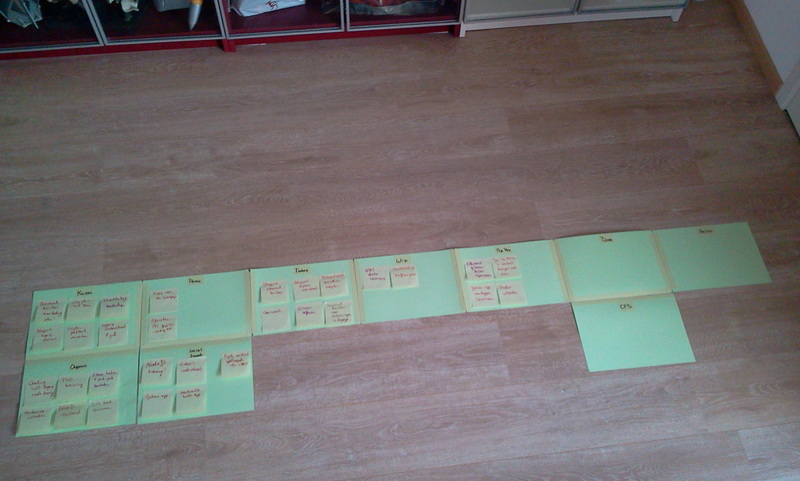 Now I can go: “Personal kanban TRANSFORM!” Although it doesn’t make the sound (yet). Thanks for sharing this post! As I type, I have a big smile on my face because of a number of associations this post has for me. We’re a household of geeks and geeks-in-the-making. We’ve been using Personal Kanban actively and creatively for the past three years. I’ve used everything from iPad apps to online boards (and still do, for various contexts), but I find the tactile, physical ones the most fun, and the most creative. We currently have one for a family road trip that is an A4 paper folder with three columns for Tomorrow, Today and Done and stickies for preparations and things we plan to do. You’ve also given me a great tip with the matrix in your backlog. Earlier today I saw the matrix in a Tweet and wondered how I could visualize in my Personal Kanban whether I was spending the right amount of time in each quadrant. And here you have given me something to go and try. So thanks for that! Love this – thanks for writing it up and sharing!